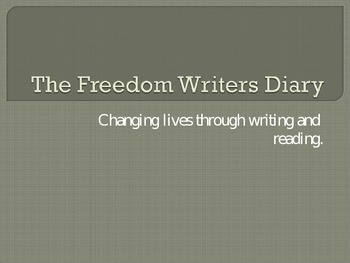 This project takes off where "The Freedom Writer's Diary" movie leaves off. The PowerPoint walks students through different scenarios from the movie and asks them to write and reflect on what they would do if they were in some of the same situations. This PowerPoint is best used in conjunction with "The Freedom Writer's Diary" Project, a Project-Based Learning activity in which students write and publish their works.